The Czech Republic is eager to expand its trade and economic cooperation with Sri Lanka and sees a very solid basis to deepen the relationship between the two countries. 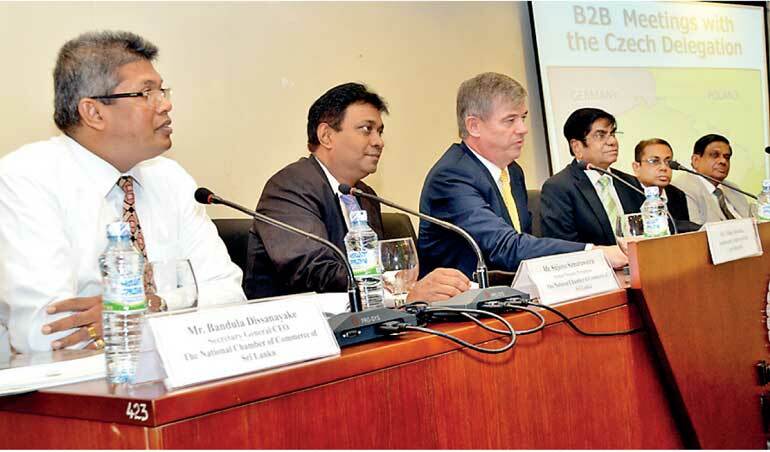 “We have a very solid basis to build on and deepen our economic and bilateral trade,” Czech Republic Ambassador to Sri Lanka Milan Hovorka said yesterday at a B2B meeting held with Czech Business Delegation and organised by the National Chamber of Commerce of Sri Lanka in Colombo. He shared positive dynamics of trade and economic cooperation between Sri Lanka and Czech Republic and stressed the interest in increasing mutual trade turnover in the coming years. “We have a long history of bilateral partnership which has evolved over time and I believe that the time has now come to benefit from these synergies and mutual understandings between the two nations to work on our general interests,” he added. Stating that there are number of sectors that Czech companies can invest in, he added that they have the right expertise, skills and knowledge especially in the high-tech areas which perfectly fit Sri Lanka’s economy. Noting that the Czech Republic intends to increase its economic presence in Sri Lanka he pointed out that the current trade between the two countries is not adequate. “We want to do it in a way that is beneficial to both countries. Our total trade is worth $ 65 million out of which $ 50 million exports are from Sri Lanka to the Czech Republic. There are hardly any exports to Sri Lanka from Czech Republic,” he added. Pointing out that they are well aware of the challenges Sri Lanka is facing at present he suggested more legal clarity in policies in order to be more investor friendly. “Legal framework is critical for doing businesses. The idea is to streamline and increase awareness, where you can benefit a lot through direct business with us,” the Ambassador said. The meeting featured six Czech Republic companies including Vitkovice Power Engineering, Eldis, Fans, Tatra Trucks, Skoda Doosan Power and Technoexport.